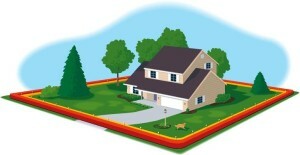 Invisible Fence® is a registered trademark of Invisible Fence,Inc. Invisible Fencing® is a registered trademark of Invisible Fence Company. PetSafe ® is a registered trademark of Radio Systems Corporation. DogWatch ® is a registered trademark of DogWatch, Inc.
Pet Stop of Middlesex County is an authorized Pet Stop® dealer. We are not an authorized dealer of Invisible Fence® brand. We understand that when purchasing a product that deals directly with your pet's safety and security, it's important to know exactly what that product is and how it works. Here we'll give you a walkthrough of the entire process, from figuring out exactly what kinds of pet containment solution you'll need, to training your pet, to troubleshooting and follow-up services and support. We want our customers to know the product as well as we do! • First, a loop of copper signal wire is installed several inches underground, enclosing the area you wish to contain your pet to. This wire is then attached to a radio transmitter that is attached to your house. • Next, your pet is fitted with a special receiver collar. This collar receives signals from the wire and will tell your pet when to back off. Upon approaching the wire, your pet will receive an audible warning signal; if your pet disregards the warning and continues, crossing the wire will result in a mild shock. • Finally, your pet will receive training on how to recognize and respect their new boundaries. Initial training by certified trainers is provided upon installation, and we also provide continued phone support for further training. After a few short weeks of training, your pet will be able to romp to their heart's content and your peace of mind, safe and secure within the confines of your property. Here at Hidden Dog Fence of MA we use a revoultionary new training method called Gentle Steps training. The Gentle Steps training method is an incredibly humaine and stress free method to train your dog to their new fence. Gentle Steps is a cutting edge training method because we use postive reinforcement. Your pet is rewarded for retreating from the boundary and uses gentle progressive/rising stimulation. The gentle introduction makes the experience stress-free for both you and your pet. An important element of the GentleSteps method is our UltraElite™ receiver. With almost endless programming possibilities, the receiver can be programmed to match the temperament of individual pets. You can rest assured that your pet is receiving the best training available with the least amount of correction. Most of our pet fences are typically installed using one of the following layouts, but it may also be possible to install a more customized layout to suit your yard. is by far our more common installation. With your entire yard enclosed, your pet may roam freely around both the front and back yards without worry of escape. To be neighbor-friendly, we recommend installing the wire at least 10' from any sidewalks that may be adjacent to your property. instead of enclosing the entire yard, the spaces between the front and back yards are blocked off. In order to move through the yards, your pet will have to go through the house. encloses either the front or back yard only, only one side of your house is protected. This layout is generally only used when your property's geography prevents the installation of a full perimeter or hourglass layout. Keep your cat off the fine furniture and your dog away from the garbage can. Along with our outdoor systems, Pet Stop offers indoor pet containment solutions as well. Our Indoor Transmitters features the same extremely customizable settings and features as the outdoor transmitting, and it has a special wireless option as well.